This post brought to you by Redpack Tomatoes. The content and opinions expressed below are that of Sugar Free Mom. 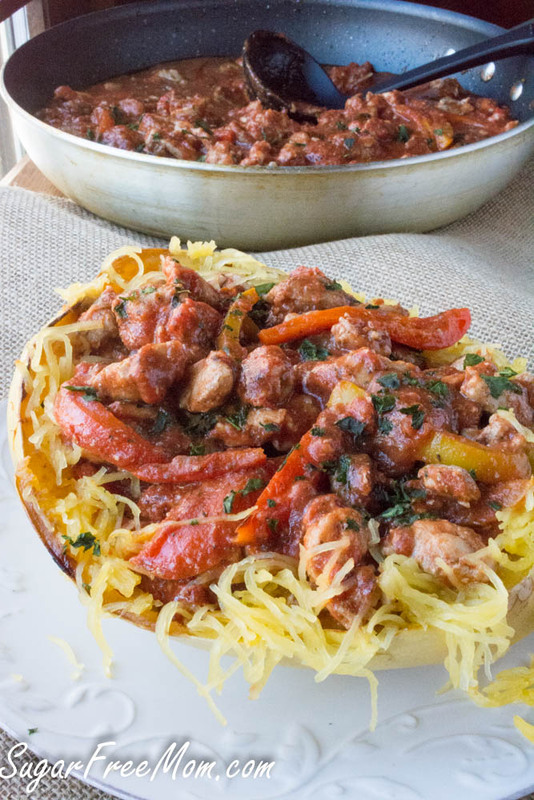 Chicken Cacciatore Stuffed Spaghetti Squash is a fabulous way to enjoy an Italian classic recipe with lower carbs than using refined white flour spaghetti. When I think of the classic Italian recipes I enjoyed eating as a child, chicken cacciatore would have to be one of my favorites. My mom always made it with chicken thighs and that’s what I always use. I grew up in an Italian household so traditional pasta was the only option, and for my parents it still is what they prefer. Although last year I made a spaghetti squash lasagna for Christmas and they actually really enjoyed it, quite to my surprise. When I was invited to create a recipe using Redpack Tomatoes, I knew it was a product I could get behind and support. Redpack Tomatoes is a quality, family owned product since 1922. Redpack has worked with local farmers for over 70 years to produce the highest quality, best tasting tomatoes. Family owned. Family Farmed. Their facilities have the highest safety and quality certifications attainable (SQF III, NON GMO Project Verified, Orthodox Union Kosher, USDA DOVS and USDA Organic). They have trusted only the best family farms in the Heartland of America to deliver their award-winning quality and flavor that cooks have relied on for generations. I appreciate the fact that these tomatoes are packed in non- BPA lined cans as well as non-GMO project verified making them a great quality product. What’s even more important to me is that there’s just 3 ingredients in the crushed tomatoes I used in this recipe! No added sugars at all! You can top this cacciatore over whatever you prefer, but if you’ve not tried spaghetti squash as a replacement to regular pasta, give it a try! You might even surprise yourself at how much better you like it. Check out my easy video! While this isn’t super low in carbs, you can reduce to a smaller serving and reduce the carbs you see below by half. Then add a nice salad and dinner is ready! Scoop out seeds and drizzle with 2 tbsp oil. Flip over and bake for 1 hour. While squash is baking saute onion, garlic, and peppers in remaining 2 tbsp oil. Set aside. Chop chicken thighs. Season with salt and pepper. 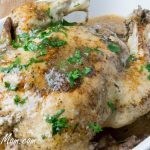 Remove veggies from skillet and cook chicken. Add veggies back into skillet. Pour in crushed tomatoes,tomato paste and seasonings. 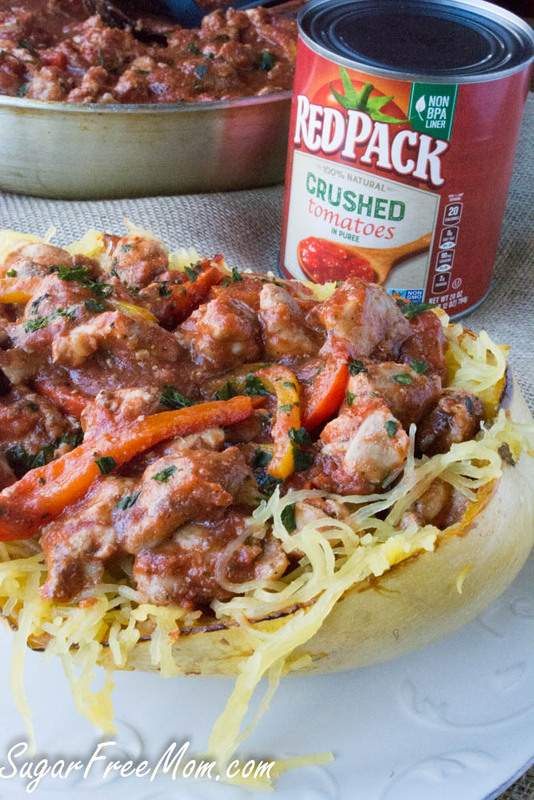 Scrape inside of spaghetti squash and top with chicken cacciatore! Net Carbs: 19.5g You can reduce the carbs in half by enjoying 1/2 cup of the chicken and 1/2 cup of the spaghetti squash instead of a cup each. Disclaimer: This post has been sponsored by Redpack Tomatoes, however all opinions are 100% my own. Thank you for supporting the brands I enjoy working with. I have got to eat more spaghetti squash!! I grew up in an Italian household also so I always had traditional pasta. 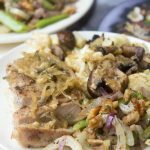 I really need to try spaghetti squash – I’m sure this is amazing! It’s a super nice change of pace. Redpack tomatoes are definitely the best! 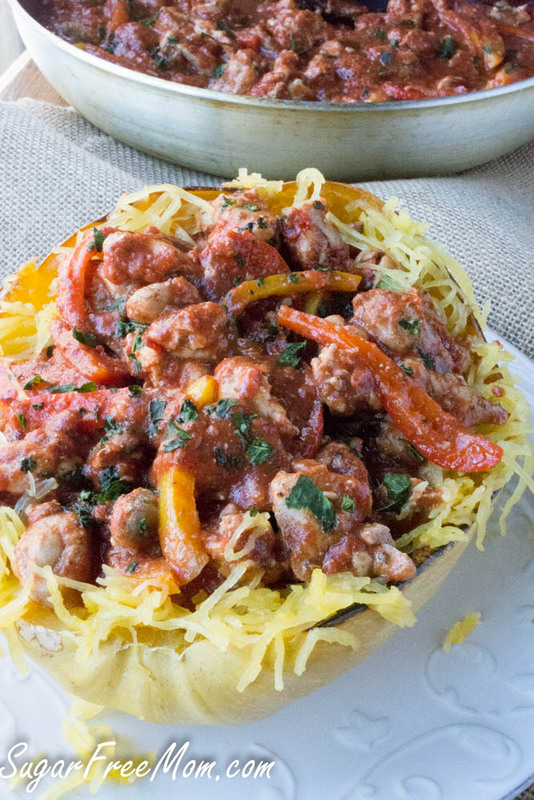 I love this healthy twist with spaghetti squash! This recipe is a winner. 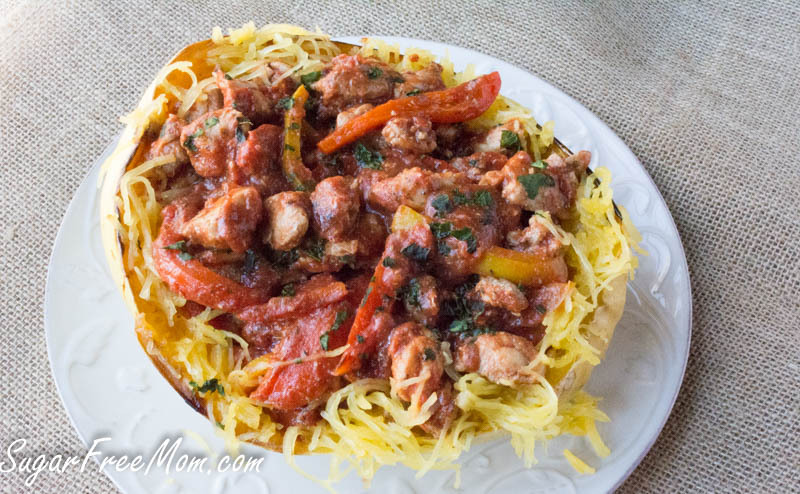 Chicken cacciatore is the perfect filling for a spaghetti squash! Thanks Renee, I thought so. 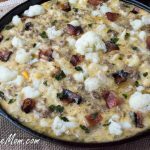 What fantastic idea for a Spaghetti Squash dinner! 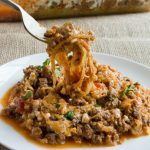 This is one of our favorite Italian recipes too and I can’t wait to make it with the Spaghetti Squash instead of regular Spaghetti! 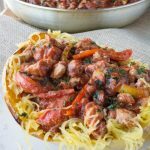 Chicken cacciatore ladled over spaghetti squash is such a great idea! So good and healthy. Love that their cans are BPA free! And I’ve got to try this. I try not to eat so many grains but it’s hard when it comes to pasta! Great recipe, Brenda! 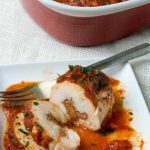 My grandmother used to make Chicken Cacciatore all the time when I was little, but I’m loving your version and can’t wait to make it! Thanks Lynne! 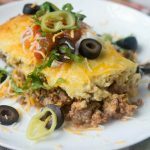 It’s a bit quicker than my mom and grandma used to make but it’s perfect for an easy weeknight meal! I love spaghetti squash, I bet I could get the hubby to eat it this way! 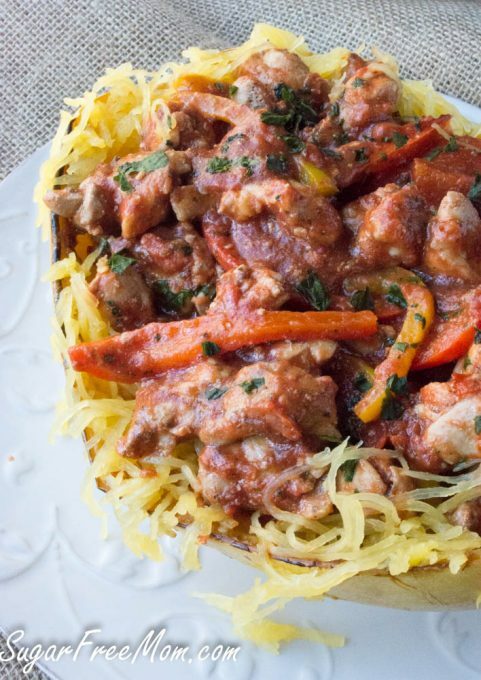 I adore spaghetti squash—so this cleaned up version of chicken cacciatore looks divine!!! Wow does this dinner look incredible! I love subbing pasta for spaghetti squash, so much more filling! What a gorgeous dish! The video is so helpful too. Love it! I have to get Red Pack tomatoes…they sound like a great brand! Cacciatore is such a no-fuss and flavorful dish. I like finding a new way to try spaghetti squash!!! This looks incredible. I love spaghetti squash, and this looks like such a flavorful way to enjoy it. I wish I had this in front of me right this very minute. It’s amazing and looks like serious comfort food. I just love the presentation!! 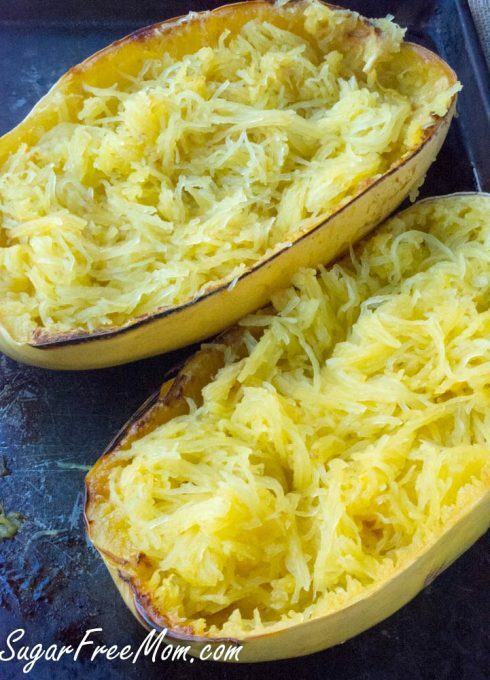 Spaghetti squash is definitely a favorite – I’m dying to try your recipe! I LOVE spaghetti squash. I seriously would eat it all winter long if I could. I just tried talking my dad into giving it a try because I know he’ll love it. The cacciatore twist is the best! I made this recipe for tonight’s supper. Eventhough I do love spaghetti squash, I used whole wheat spaghetti and topped it with the chicken cacciatore mixture. It was delicious and got two thumbs up from my husband and picky eater preteen son. It was easy to make also. Thanks for the recipe. I know this might sound like a silly question, but the red and yellow peppers…are those hot peppers or bell peppers?